Like the Lost City for which it was named, Atlantis Bahamas captures the imagination of explorers of every age. Unless you've been there, the Atlantis is hard to imagine. Part resort, part water park, part aquarium, with numerous restaurants and a big ocean-themed casino, Atlantis has something for just about everyone. Right across a narrow channel from Nassau, but light years away from the dust and traffic. Whether it's snorkeling in the lagoon, feeding fish at one of the marine habitats' interactive feedings, or daring to plunge down the nearly vertical drop known ominously as The Leap of Faith (I've done it twice even though I've got a healthy fear of heights), there's an adventure here for everyone. The Atlantis Casino is a place for slots and table games alike, plus they offer free gaming lessons for anyone looking to learn about craps, roulette, or baccarat. The Atlantis Bahamas currently boasts several different properties where you can stay. One of the bellmen at the Cove recently told me, “Millionaires stay at the Cove. Billionaires stay at the Reef.” You’ve got a large choice when it comes to where to stay, choices with varying price tags and levels of luxury. The Reef is also called The Residences because they are condominiums where you can live. A few years ago when I was a grad student, they tried to get me to buy one. It made me laugh—prices started at $700,000! I told them, “If I had seven hundred thousand dollars, I would definitely live here!” You get the benefits of staying in a condo with a kitchen, but when you book a unit at the Reef, be sure to check what kind of additional fees will be added. The Cove Atlantis with its open air lobby and Cove-only pool and beach, including Cain, where you can rent a cabana on the beach, appeals to those who don’t mind paying for luxury. My brother’s family always stays here, and they love it even though they have no facilities for doing laundry and have to rely on housekeeping. The Royal Towers are the iconic image you see in the advertisements for the Atlantis Bahamas. If you want to stay right in the middle of the action, book a room at the Royal Towers. It’s more expensive than the Bach or Coral Tower, but it’s newer and more luxurious with more attractive rooms. The Coral Tower offers comfortable, basic rooms and is more centrally located then the Beach Tower. At certain times of the years, you need to beware of drunken packs of young people who have graduated or are on Spring Break and can only afford the Beach or Coral towers! I’ve heard people call The Beach Tower a dump, but others say it’s not too bad. All agree that the rooms are old and ugly and it’s a long walk to get anywhere, especially since Beach Tower guests have to check in and out in the lobby of the Coral Tower. For economical accommodations, consider staying at Harborside Resort at Atlantis. The well-appointed apartments come with fully equipped kitchens, and the Harborside Pool is never crowded. 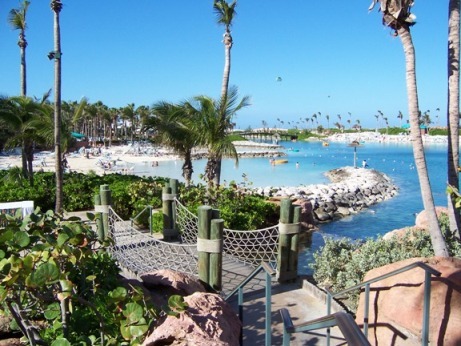 Check out Harborside Resort: Tips & Tricks for more information on how to enjoy your stay and stay within your budget at this homey part of the Atlantis in the Bahamas.